Thursday March 10th 1904 I baked a cake for the church sociable while I was doing the other work. I sewed all afternoon. The boys still hauling wood. 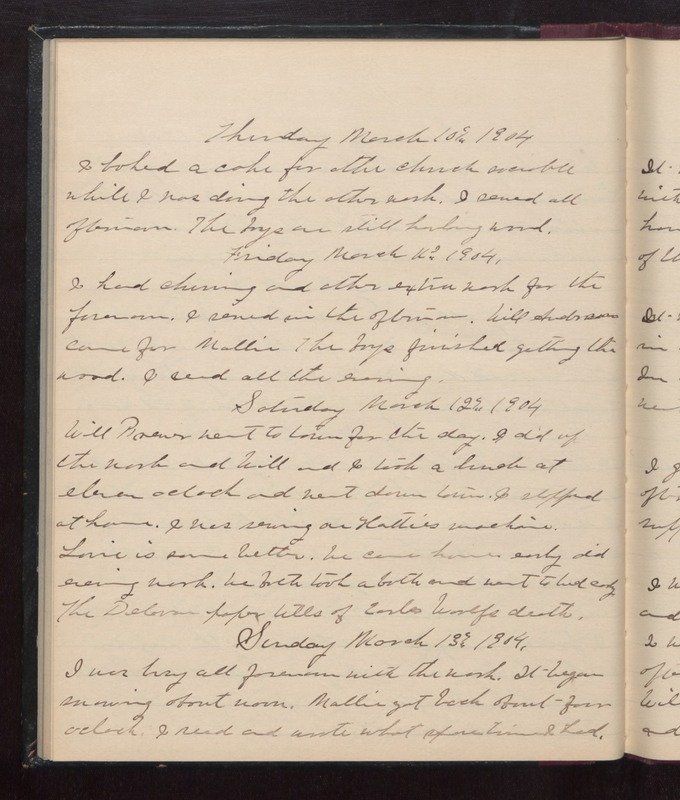 Friday March 11th 1904 I had churning and other extra work for the forenoon. I sewed in the afternoon. Will Anderson came for Mollie. The boys finished getting the wood. I read all the evening. Saturday March 12th 1904 Will Brewer went to town for the day. I did up the work and Will and I took a lunch at eleven oclock and went down town. I stopped at home. I was sewing on Hatties machine. Lorie is some better. We came home early did evening work. We both tool a bath and went to bed early. The Delavan paper tells of Earl Woolfs death. Sunday March 13th 1904 I was busy all forenoon with the work. It began snowing about noon. Mollie got back about four oclock. I read and wrote what spare time I had.